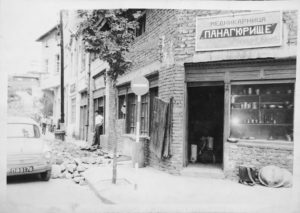 Coffee and Gallery Cu29 is housed in the former coppersmith’s shop of our great-grandfather Petar Tolev. Petar Tolev is born in 1906 in the town of Panagyurishte, in a big family with five brothers and one sister. He is one of the most prominent coppersmiths in Bulgaria, with unmatched and recognizable style and special treatment of the copper. 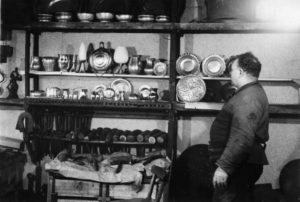 For decades he creates huge number of copperware with different purpose, from household objects and items to works of art. 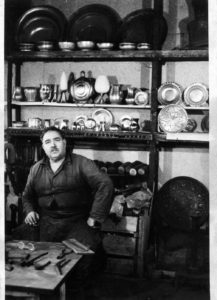 A member of the fellowship of the masters, for long years he creates copperware for export, and items given as presents to diplomatic officials. When he is 14 years old he leaves his home town to become apprentice and to study the coppersmith craft. Over the years Petar Tolev becomes owner of several craft shops in Kapana, and today Coffee & Gallery Cu29 is located on the territory of one of them. Tireless workaholic uncle Petar, as he is called by most people, throughout his life never stops learning new techniques and methods for improvement of the craft. He is the last coppersmith of Kapana, and a whole glorious era of original craftsmen dies with him. 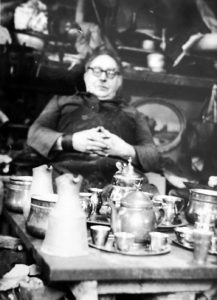 It is said about him, that his soul and his life were in the shop, where his world was – among the magic of the copper. With Coffee & Gallery Cu29 we hope to keep the memory of uncle Petar alive, commemorating his work. You will be guided by the delicious coffee aroma. Coffee and Gallery Cu29 is located in the very centre of Plovdiv, in the heart of the art quarter Kapana. Here you will find artistic environment and various events: exhibitions, workshops, lectures, thematic film screenings, etc. Copyright © 2019 Coffe&Gallery Cu29.